THE UNWANTEDS is one of those buzz books that I heard about so much I finally picked it up. 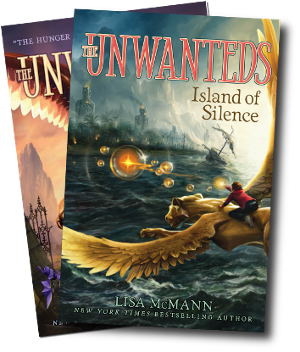 I read the first book earlier this year, before I started participating in Marvelous Middle Grade Monday, but now there’s a second one, and I’m thrilled to cover THE UNWANTEDS: ISLAND OF SILENCE today. If you haven’t read the first book, you may want to hold off on reading this review as even the description of this second book gives away quite a bit of the first one. The battle is over. The magical barrier between the dreary land of Quill and the fantastical world of Artime is gone. Now residents of both places are free to mingle, but tensions are high. The artistic warriors of Artime struggle to forgive those in Quill who condemned them to death, while the Quillens attempt to recover from the shock of Artime’s existence, the loss of their leader, and the total collapse of their safe, orderly world. Alex Stowe has recovered from his physical wounds since his death-defying role in Artime’s victory, but his confidence is shattered. He battles self-doubt after Artime’s beloved mage, Mr. Today, makes a stunning request, which is further complicated by the mysterious arrival of two silent, orange-eyed teenagers. Meanwhile in Quill, Aaron is devastated by his fall from grace. Spurred by rage, Aaron devises a masterful plan of revenge that will return him to power … if no one gets in the way. 1. “The Hunger Games Meets Harry Potter.” –Kirkus Reviews, on Book One of The Unwanteds – Ok, so that’s a tall order to live up to. I loved both of these series (I know, who doesn’t? ), so that line immediately caught my attention. I couldn’t imagine how a book would combine those two very different stories, but THE UNWANTEDS really does. I would dare to say this second book goes a little more in the HUNGER GAMES direction. It’s definitely for older MG readers. Some seriously bad stuff happens that might upset younger readers. 2. The point of view – I don’t write in omniscient point of view, but I appreciate when someone does it well. Lisa McMann has it down. We get glimpses into a number of characters, but particularly with the secondary antagonists, she gives just enough to make you wonder if they’re really antagonists at all or if they have some other plan. She kept me guessing, and that kept the tension up, so well done. 3. The What?! factor – I could also call this the major twist, but since it actually made me say “What? !” out loud, I figure this is more appropriate. Something happened in this book that caught me totally by surprise, but it wasn’t unearned, and I love it when an author can pull that off. 4. The character arc – Even more than in the first book, ISLAND OF SILENCE shows Alex growing into his own. Others, particularly Mr. Today, see his potential before he does. It’s great to see him drawing from his inner strength to make tough decisions about his friends, his brother, and his future. He truly figures out his place in the world, and I can’t wait to see what he does with that assurance in the next book. 5. The ending – The book ends with the kind of cliffhanger that made me want the next book right away. I’m not sure how many books are planned in this series, but the way Lisa McMann turned the story on its ear in this one sets up the potential for something epic in the third book. It’s one of those times where I wish I hadn’t read the books until all of them were available. Oh well, too late now. Have you read this series? What do you love most about it? For querying writers, Lisa McMann is represented by Michael Bourret of Dystel & Goderich Literary Management. I’m looking forward to reading this one. I recently read the first one and thought it was a perfect MG fantasy. Definitely. I just got the first one for my husband. I told him he couldn’t read today’s review until he finishes it. I love the “What?! factor.” And wow, Hunger Games meets Harry Potter! Okay, I confess I haven’t read the first book yet, so I skipped over the description of book two, but couldn’t stop myself from reading your five things. Other MMGM participants have mentioned this book too. Definitely adding them both to the TBR list. Yes, these books are a definite must-read. I didn’t totally believe the Hunger Games meets Harry Potter description until I read the first book, but it’s really an accurate description. I look forward to seeing your thoughts when you get to these! I confess, I didn’t read your review thoroughly in case it revealed some details I didn’t want to know…yet. My daughter and I are reading this aloud–right now!–and I didn’t want to know too much. We are loving it, I should say. And my daughter read the first on her own and loved it as well! It totally lives up to the first one. I hope you stop back by when you finish! Yet more books for my pile! Thanks for the great review, Michelle! Yes, definitely add them! Thanks for stopping by. I read this recently and really liked it for all the reasons you do. Can’t wait for book 3. Thanks for stopping by, Natalie! I love your posts on Literary Rambles. I’ve read the first one and it left me 50% satisfied and unsatisfied. Probably because of the similarities with HP and maybe I had way too high expectations. However I do have to agree the writing is great and this POV is my favorite. Lisa M. did a good job because I still do want to see what happens next. I’m looking forward to reading more about the secondary characters than Alex himself though. I know how that is. I’ve gone into a book with too-high expectations before and been disappointed. This second book definitely goes into many other characters, so you’ll get a taste of more than Alex. I hope it’s more satisfying! Just caught the highlights of your review- as to not read any spoilers. What did I get? I must read this series- it sounds fabulous! Thanks! Yes, you must! As long as you skipped the description, you should be spoiler-free. Hope you love it!